Many varieties of potato can be roasted but floury King Edwards are definitely the best. Roast potatoes will never be a healthy option but if you want to make a gesture in that direction then use olive oil to replace the lard. Cut the potatoes into pieces large enough for two bites. Put them in a saucepan of cold, salted water and bring to the boil. Boil for 5-7 minutes then drain. Put the lid back on the pan and shake the potatoes quite heftily so that they become fluffy around the edges. Put a large roasting tin on the hob and melt enough fat to form a thin layer over the base, about 25g. Let the fat begin to sizzle before you add the potatoes (use an oven glove to hold the tin as the fat will splutter). Tip the tin and baste the potatoes to coat with fat. Place the potatoes in the oven for 45-50 minutes at 200°C, gas mark 6 until crisp and golden brown. Move the potatoes only once or twice during cooking, otherwise the edges will not crisp and brown. Season well before serving. 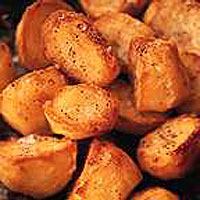 Waitrose Frozen Roast Potatoes are an excellent option if you don't want to make them from scratch. To add a homemade touch, scatter 3-4 peeled and thinly sliced garlic cloves into the roasting potatoes.